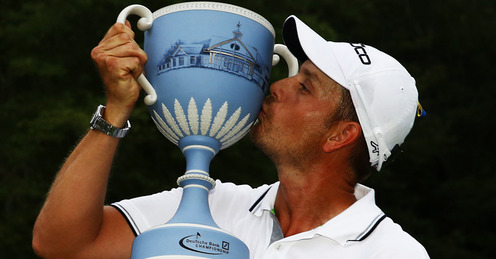 After contending in several tournaments in the past two months and doing everything but winning, the red hot Henrik Stenson finally won the 2nd tournament of his relatively brief PGA Tour career Labor Day Monday. Despite battling a cold, he put together four terrific rounds of golf in the second leg of the pressure cooker that is the PGA Tour Playoffs, the Deutsche Bank Championship, closing with a 5-under par round of 66. Stenson got off to a rather slow start, hitting his second shot on the Par 5 2nd hole into a water hazard and making a bogey 6. From there, he played terrifically, with birdies on holes 4, 5, 6, 8, 11 and 17 the rest of the way. In that stretch after Hole 2, he did not make a single bogey or worse. Although most of his birdies were off of stellar approach shots, he holed a difficult bunker shot on the 17th hole for his final birdie of the day. It capped off an impressive round and tournament for the Swede who was more than due for a dramatic victory. Steve Stricker, who has had a solid year in his own right despite playing a reduced schedule, finished just behind Stenson at 20-under. He put together an impressive weekend, shooting 12-under when other luminaries such as Phil Mickelson and Tiger Woods could only manage around par for the final two rounds. This was his third 2nd place finish this year in just 11 events, though it is one of the few in recent years in which he has not won. Another hot player of late who racked up a good finish was Graham DeLaet, finishing third at 18-under. One of the best drivers in the game at the moment, he had another good ball-striking round, but just had a bit of trouble getting some good chances for birdie to drop until the last few holes. The three aforementioned and 67 other hungry players try to gain or maintain their momentum in less than two weeks when the PGA Tour resumes on September 12th with the BMW Championship in Lake Forest, Illinois. The venue this year is a new one for the tournament and the PGA Tour, Conway Farms, and proves to be interesting for that reason alone.